When ripping large quantities of CDs, you really have to have an efficient way to query and edit CDDB entries. So here’s an Emacs library for doing that. It includes a bunch of convenience functions for fixing up other people’s bad entries, and you also have all the standard Emacs editing commands at your, er, command, so it’s rather nice. I also download the entire database from freedb now and then. It’s useful mainly when sampling (old) vinyl. By using an approximate match for the albums, I can usually find the album in question, which means less typing for me. However, the DISCID collisions these days are just ridiculous. I’ve written about this before, but the situation is as ridiculous today as ever. I mean, even more so. 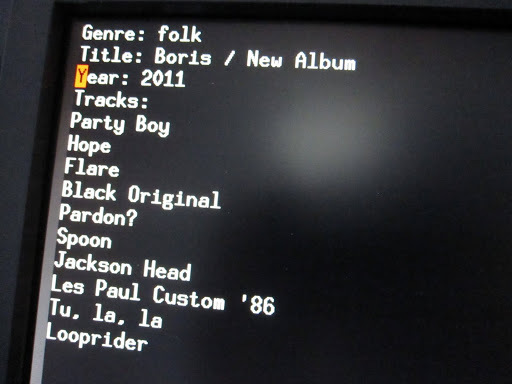 It’s now impossible to submit any new album on the “rock” category, so everything I submit now is apparently “folk” or “data”. Re collisions: Have you considered musicbrainz.org instead? They seem to have a better concept for identifying discs. musicbrainz is a proprietary service, isn't it? The problem is when submitting, not querying, so I doubt that musicbrainz could have a (significantly) better CD identification system than freedb. The MusicBrainz data is free (public domain + Creative Commons): http://musicbrainz.org/doc/About_MusicBrainz – The software is GPL/LGPL. I've found that it handles collisions well, but I am too lazy to look up how/why. Ah, right. I was thinking about Gracenote. It looks like the MusicBrainz people have done the right thing with their ID system, so there'll be fewer collisions. Next Next post: Emacs Can Haz Brainz?